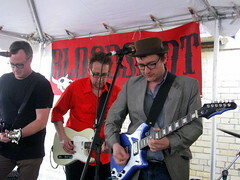 The first part of Friday I went to the annual Bloodshot Records party at the Yard Dog Gallery. I got there just in time for JC Brooks & The Uptown Sound. He's Bloodshot's entry into the soul-revival -- a revival, like I've said before, that has been going on for years and hopefully will be for a long time. Brooks is a young guy from Chicago, but he's obviously well versed in the book of Otis Redding, Wilson Picket and other founding fathers of southern soul. 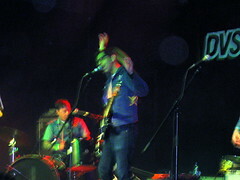 His band -- guitar, bass, drums and keyboards -- is nice and tight. Brooks plays mainly original tunes but one real crowd pleaser is their cover of Wilco's "I Am Trying to Break Your Heart," which is the first song by J.C. I ever heard. I never envisioned that tune, (which starts out, "I am an American aquarium drinker ..." ) as a soul workout when I first heard Wilco do it all those years ago. But I'm glad J.C. Brooks did. 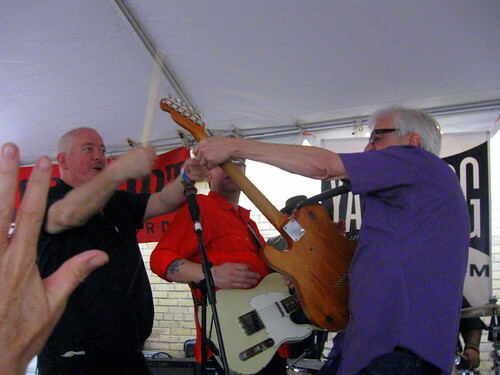 It just wouldn't be a South by Southwest trip for me without seeing The Waco Brothers at the Yard Dog. I've seen them every SXSW I've attended since 1996. And yesterday I passed over Roky Erikson, T. Tex Edwards and many other shows to see them again. And the Wacos, fronted by The Mekons' Jon Langford -- foul-mouthed, self-mocking and charming as ever -- didn't disappoint. I knew they wouldn't. Amazingly, The Waco Brothers haven't released an album since their 2008 live set (released just before the last time I saw them.) But now, they're about to release a collaboration with Paul Burch, a wonderful country singer himself. Unfortunately on most the songs Burch sang yesterday were severely under-miked. I guess I'll have to wait until the album to fully appreciate them. Probably the highlight of the show was when then band was joined by Bill Kirchen -- former guitarist for Commander Cody & His Lost Planet Airmen. With Kirchen, The Wacos unleashed a downright apocalyptic version of "Folsome Prison Blues." That was the afternoon/early evening. For the night shows, I spent all my time at the new Emo's -- Emo's East, where the former Sixth Street punk rock institution presented a free show (not associated with SXSW) hosted by In the Red Records. 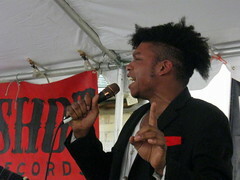 I went for The Gories and Kid Congo Powers & The Pink Monkey Birds -- two bands I saw a couple of years ago in New York. 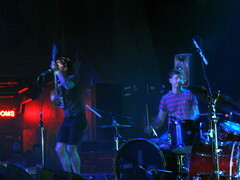 But I was surprised and impressed with another band Thee Oh Sees. This San Francisco band has two drummers as a well as a male and female singer. They're hard-driving, playing songs based on tasty garage-rock riffs. My only complaint is that the last song they played, a droning psychedelic excursion (sorry, I'm not familiar with the titles) was too long and repetitive. The sets at Emo's on Friday tended to be short and they probably could have fit in two shorter snappier numbers here, But overall, I still want to check out more of Thee Oh Sees. Kid Congo has to be one of the most under-rated, under-appreciated musicians working today. His rock 'n' roll resume is impeccable (The Cramps, Gun Club, Nick Cave & The Bad Seeds.) But his music with The Pink Monkey Birds is wildly original -- mostly original instrumentals or songs in which the only vocals are the Kid speaking the lyrics. Hey Hey We're the Gories! 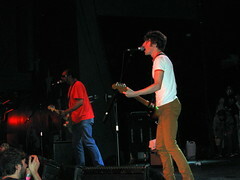 The Gories are as loose as The Pink Monkey Birds were tight. But that's their heritage, a proud tradition since the 1980s they must uphold. The group -- guitarists Mick Collins and Dan Kroha and drummer Peggy O'Neill -- broke up in the 90s, but a few years ago got back together for a reunion tour. This, I believe is their third such reunion. They aren't ready for the casinos yet, but they were just right for Emo's. Unfortunately the all-ages crowd began to seriously thin out by the time The Gories went on.